Background and objectives The illness trajectory in the last year of life in advanced (stage 5) chronic kidney disease is poorly understood. Mapping the trajectory of patient-centered outcomes could facilitate better care. The objectives of this study were to determine trajectories of symptoms and wider health-related concerns in the last year of life in stage 5 chronic kidney disease, managed without dialysis. Design, setting, participants, & measurements A longitudinal symptom survey in three UK renal units was used, using the Memorial Symptom Assessment Scale–Short Form and core Palliative Care Outcome Scale. Average (using mean scores over time) and individual (using individual scores over time, with visual graphical analysis) trajectories were mapped. Results Seventy-four patients (mean age, 81 ± 6.8 years) were recruited; 49 died during follow-up. Average trajectories showed moderate symptom distress and health-related concerns, with marked increase in the last 2 months of life. Visual graphical analysis enabled stable, increasing, or fluctuant individual trajectories to be identified. The proportion following these trajectories varied between outcome measures; regarding symptoms, 50% followed a stable pattern, 24% increased, and 21% fluctuated compared with 26%, 57%, and 21%, respectively, for health-related concerns. Inter-rater agreement in grouping trajectories was high (κ statistic, 0.80 and 0.86, respectively). Conclusions In the 2 months before death, patients reported a sharp increase in symptom distress and health-related concerns. Health care should anticipate and address this increase, which may indicate the patients is approaching death. Considerable individual variation and flexibility/responsiveness of care is important: one size of service does not fit all. In developed countries, prevalence of chronic kidney disease (CKD) is rising steadily, with a disproportionate increase among older people. In the United Kingdom, the annual acceptance rate for renal replacement therapy (RRT) has increased from 20 per million population (pmp) in 1982 to 108 pmp in 2008, with growth predominantly among those >65 years of age with comorbid conditions (1). More than 25% of all people starting RRT are now ≥75 years old (2). There is increasing recognition that dialysis may not be the best choice for patients with high levels of comorbidity and poor functional status (3,4). Conservative (nondialysis) management pathways are becoming established as a potential alternative to dialysis for stage 5 CKD patients with high comorbidity and poor functional status (5), not to ration limited dialysis resources but because of the limited benefit and considerable burden of dialysis among selected patients (6). Conservative pathways focus on slowing the decline in renal function, actively managing symptoms, advance care planning, and provision of appropriate palliative and end-of-life care (6–11). Patients who choose conservative management can survive some time and achieve similar numbers of hospital-free days as dialysis patients (12). However, there is little evidence to inform care for conservatively managed stage 5 CKD patients. The limited evidence on survival consists of small observational studies (3,4,6,13–16), and there are few studies of patient-related outcomes such as symptom burden, functional or symptom trajectories, patient concerns, and quality of life. Most evidence relates to the dialysis population, making it hard to plan and deliver high-quality care for conservative patients. The concept of distinct trajectories of illness over time and toward death is well established in other advanced diseases (17–19). Different functional trajectories over the last year of life have been described in cancer and noncancer conditions (18–21), but not ESRD. For patients and for professionals planning and delivering care, an understanding of what trajectory of illness to expect can inform best timing and configuration of care. This study therefore aims to describe, for patients with stage 5 CKD managed conservatively (without dialysis), the trajectory of symptoms and patient health-related concerns over the last year of life. We conducted a prospective cohort study of symptoms and patient health-related concerns over time and toward death in a group of patients with stage 5 CKD who were conservatively managed. Cross-sectional analyses of symptom data collected at study entry (22) and in the month before death (23) have already been published; this paper reports the longitudinal analyses. The study group consisted of patients with stage 5 CKD managed conservatively (without dialysis) recruited who were from three renal units in the United Kingdom (London and South East England), over an 18-month period from April 2005 to Oct 2006. All three renal units have specific conservative management services. Two have dedicated renal palliative care nurse specialists coordinating and providing much of the service, including clinic review and home visits as necessary, with support from nephrology staff as required. The third unit is more rural—with more home-based care, telephone support, and home visits from nephrology staff and greater integration with primary care and specialist palliative care. Known stage 5 CKD patients, with an estimated GFR (eGFR) ≤15 ml/min (using the Modification of Diet in Renal Disease formula) (24), with a definite decision (supported by their renal team) for management without dialysis (conservative management) were included. Patients were excluded if they lacked capacity to consent to research participation, as judged by clinician assessment. Data on symptoms and patient health-related concerns were collected from participants every 28 ± 7 days by postal questionnaire until death or study end, using the Memorial Symptom Assessment Scale–Short Form (MSAS-SF) (25) and the core Palliative Care or Patient Outcome Scale (core POS). MSAS-SF enables patients to report the presence and severity of 28 physical and 4 psychologic symptoms during the previous week. It has been validated in advanced disease, including both cancer and noncancer conditions (25,26), and has been adapted for CKD (27). It provides a 10-item global distress index (MSAS-GDI) to measure overall symptom distress; MSAS-GDI was used as a primary outcome in this study. The core POS is a 10-item scale capturing the concerns most common to patients with advanced disease in the last months or year of life, including anxiety, family concerns, information needs, opportunity to share feelings, depression, self-esteem, time wasted at appointments, and practical matters. It has been validated in advanced disease (28) and is widely used internationally (29–32). The total POS score provides an overall measure of patient health-related concerns and was a second primary outcome measure in this study. For both MSAS-SF and POS, higher scores represent worse (increased) symptoms or concerns. Data were classified as missing if the questionnaire was absent, not completed within 7 days of the expected date, or individual items were not completed. Participants reported if they had completed the questionnaires alone or with help from family/friends or professionals. Demographic and clinical data were collected on age, gender, ethnicity (UK Office for National Statistics categories), disease severity (measured by Modification of Diet in Renal Disease eGFR formula) (24), primary renal pathology (UK Renal Registry categories) (33), and comorbidity (using the comorbidity scores of Davies et al. (34) and Charlson et al. ). Data on functional status were also collected, using the Karnofsky Performance Scale modified to relate to home and outpatient care rather than hospitalization (36). All outcome measures were displayed on identical x- and y-axes and transformed to a 0 to 100 scale to facilitate comparison. Trajectories of symptoms and patient concerns (using the primary outcome measures of MSAS-GDI and core POS) over the last year of life were mapped for those who died, using the mean score from all study participants who died to derive an average trajectory and the scores for individual participants to derive individual trajectories. For the average (mean) trajectories of the study population, mean scores, SDs, 95% confidence intervals, and range were reported at each time point, and the size of the sample from which the data were drawn. Individual trajectories were mapped if they extended up to or beyond the 25 percentile of duration of follow up for all study participants. The individual trajectories were categorized and grouped using visual graphical analysis (VGA), an exploratory approach that allows patterns of convergence and divergence to be recognized (37). VGA is a research technique that has been described as bringing qualitative processes to numeric data and capturing individual trajectories that may otherwise be lost in reductive statistical approaches (37). Individual plots are inspected, using detailed interindividual and intraindividual comparison to (1) disclose common patterns, (2) pinpoint divergent cases, and (3) develop trajectory groupings. Grouping criteria were applied by the research team and then reapplied separately by an independent blinded researcher, with comparison of agreement using κ statistics. Statistical categorization of the individual trajectories into groups was also undertaken to triangulate VGA groupings (38). Comparison of (1) the study sample with the population from which the sample was drawn, and (2) those who died with those still alive at study end is reported elsewhere (22). All analyses were conducted using STATA version 9.2. All patients included in this study signed informed consent, and the study received formal ethical approval from the King's Main National Health Service Research Ethics Committee (COREC 04-03-092). Across the three renal units, 142 patients with stage 5 CKD were managed conservatively (all patients managed conservatively were identified from the clinical renal databases). Of these, 23 had insufficient capacity to consent, 17 died or were transferred elsewhere before recruitment, and 102 were invited to participate. A total of 74 agreed to participate (response rate, 73%). Detailed comparison of participants with nonparticipants is reported elsewhere and shows no difference between participants and nonparticipants in terms of demographics, primary renal diagnosis, or comorbidity (22). During the study, 49 participants (66%) died, whereas 25 (34%) were alive at study end. For the 49 participants who died, survival from study entry ranged from 7 to 669 days. Forty-nine percent of participants completed the questionnaires unaided, 44% with help from family/friend, and 5% with help from a professional. Table 1 describes the 49 participants who died in terms of their demographic and clinical variables. Comparison of those who died with those still alive at study end (22) showed no significant differences in the distribution of measured variables, with the exception of poorer renal function and worse functional status at study entry for those who died (mean eGFR 11.0 mL/min/1.73m2 versus 12.6 mL/min/1.73m2, Mann-Whitney U test: z = 2.389, P = 0.02; median Karnofsky Performance Scale 60% versus 70%, Mann-Whitney U test: Z = 2.64, P = 0.008). Age, gender, ethnicity, and comorbidity showed no significant differences in distribution among the two groups. Predominant symptoms at baseline were lack of energy (76%), pruritus (74%), drowsiness (65%), dyspnea (61%), pain (53%), and restless legs (48%). By the month before death, prevalence had increased to lack of energy (86%), pruritus (84%), drowsiness (82%), dyspnea (80%), pain (73%), and restless legs (65%), and nausea had also become prevalent (59%). Full details of these cross-sectional analyses are reported elsewhere (22,23). Table 2 provides details of the change in symptoms between baseline and the month before death. Levels of global symptom distress (MSAS-SF GDI) increased, as did both physical and psychologic symptoms, although the latter were more marked. The number of symptoms reported also increased. Concerns beyond symptoms (core POS) also increased notably between baseline and the month before death (Table 3). This was mediated largely by increased anxiety, low mood, family anxiety, and increased information needs and practical concerns. Figures 1 and 2 show average (mean MSAS-GDI or mean total POS score) trajectories of symptoms and patient concerns over the last year of life for those who died. Mean scores, SD, 95% confidence intervals, and range are reported at each time point, and the size of the sample from which the data are drawn. Not all participants contributed data for every time point, because some died before 12 months of follow-up was reached. These are described as not yet recruited for time points before their recruitment. Trajectory of mean MSAS-SF, Memorial Symptom Assessment Scale–Short Form (MSAS-SF) Global Distress Index (GDI) over the last year of life. 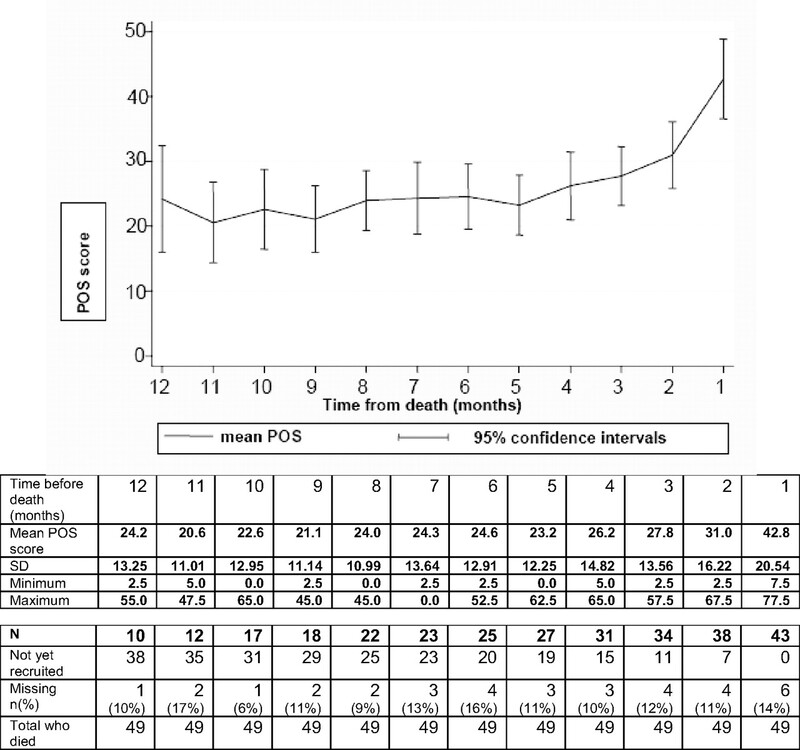 Trajectory of mean total Palliative Care Outcome Scale (POS) score over the last year of life. The median length of follow-up of study participants was 8 months (range, 1 to 23 months; 25th percentile, 4 months). Individual trajectories were plotted for all participants with ≥25th percentile follow-up, i.e., with 4 or more months of follow-up, for (1) VGA and (2) statistical categorization. Of the 49 participants who died, 34 (69%) had at least four data collection points. The individual trajectory of one participant could not be plotted because of missing data—individual trajectories are therefore presented for 33 participants. Systematic VGA showed three main patterns of individual trajectory: stable, increasing, and fluctuant. These categories were derived iteratively, through visual inspection, developing criteria, applying them to the dataset, reviewing deviant cases, and then revising criteria, until all individual trajectories could be categorized into discrete and distinctive groups. As well as visual criteria, statistical criteria were also derived in the following steps. (1) A best-fit straight line, using ordinary least squares, was fitted to each individual trajectory (a linear model was chosen because it accommodated much of the interindividual variation between trajectories, yet remained straightforward). (2) For each individual trajectory, statistics of slope and residual variance were derived from the fitted line. (3) These statistics were collated into a secondary STATA database. (4) Medians and percentiles were calculated for slope and residual variance from all individual trajectories. (5) These summary statistics were used to derive statistical criteria that reflected the visual criteria. The full visual and statistical criteria are presented in Table 4, with the flow chart used to apply the visual criteria in Figure 3. Flowchart for categorization using visual criteria. The individual trajectories, grouped according to the visual criteria, are shown in Figure 4, A (symptoms) and B (other concerns). For both MSAS-GDI and POS, one (different) individual trajectory could not be grouped using the criteria developed, so 32 individual trajectories are depicted. Table 5 shows the distribution of trajectory grouping across the two primary outcome measures. (A) Individual trajectories of symptom distress over the last year of life measured using MSAS-GDI (n = 32) and grouped using VGA. (B) Individual trajectories of patient health-related concerns over the last year of life, measured using core POS (n = 32). Specific symptoms did not dominate any one type of MSAS-GDI trajectory—in particular, fluctuant trajectories were not characterized by any specific symptom(s) but rather by changes in the levels of distress reported from a range of symptoms over time. However, the increases and fluctuations seen in the increasing and fluctuant POS trajectories were most often because of increased anxiety, low mood, family anxiety, unmet information needs, and increased practical concerns. Agreement between the independent researchers in grouping the trajectories of symptom distress and health-related concerns, using the visual criteria, was very high (κ statistics, 0.80 and 0.86, respectively; n = 33). Agreement between visual and statistical criteria was less high, but still substantial (according to the definition of Landis and Koch ), with a κ statistic of 0.68 and 0.60, respectively (n = 33). This prospective cohort study enabled the trajectory of symptoms and wider health-related concerns to be described in the conservatively managed stage 5 CKD population. On average, this cohort experiences moderate levels of symptom distress and health-related concerns over the last year of life, with a marked increase in both symptoms and concerns during the last 2 months of life. This increase is especially marked in the trajectory of wider health-related concerns; patients report increasing concerns about information needs, practical matters, and family anxieties in addition to increasing symptoms. Understanding these trajectories can facilitate best care and inform optimal timing of discussions about goals of care, symptom management, and advance care planning (40), to achieve the best possible quality of life in the last months of life. The overall increase in symptoms toward death, for example, may be a better indicator of approaching death than relying on biochemical measures and could be a useful clinical trigger for advance care planning to anticipate crisis or deterioration in the last weeks of life. In contrast to these average trajectories identified in the population as a whole, detailed analysis of individual trajectories showed that the average pattern masks considerable individual variation. Distinct individual trajectories have been reliably identified, using novel visual graphical methods. Three discrete trajectories in the last year of life have emerged of (1) relatively stable, (2) steadily increasing, and (3) markedly fluctuant patterns of symptom distress and health-related concerns over time. Care needs to be adapted therefore to match the trajectory which any individual patient is following. One size of service will not fit all. Those following a fluctuant trajectory, for instance, will need more frequent review of symptoms, assessment of other concerns, and increased psychologic and social support to address the uncertainty of an unpredictable course. Responsiveness and flexibility in care provision are needed if symptoms and concerns of individual patients are to be effectively addressed. The approach to analysis undertaken in this study needs some consideration. Analyzing data in relation to death is an established approach in palliative care research, used in seminal studies such as the National Hospice Study (41), UK work on the effectiveness of palliative care teams (42), and other more recent work (43–45). It enables measurement of outcomes in relation to death and insight into the symptoms, concerns, and transitions that may precede or predict death. However, the use of VGA adopted by this study to group individual longitudinal data is novel in end-of-life research. This approach is underpinned by previous exploration of longitudinal data in advanced illness (46), recommendations from other areas of health research on the value of plotting/using raw data of changes over time (47), and suggestions for using visual criteria iteratively (37). It has the advantage of enabling longitudinal data from a relatively small cohort of participants (common in end-of-life research) to be used effectively to understand and contrast the differences between summary data (which informs the average trajectories) and individual data (which more closely reflects individual patient experiences). Illness trajectories in advanced kidney disease have infrequently been studied, perhaps because of the resources required for sustained longitudinal data collection and the need for relatively large numbers for formal statistical analyses of the complex longitudinal data thereby derived. Older populations with other (nonrenal) organ failures also show increasing (48) or fluctuant (49) symptoms over time. The wide range of symptoms and concerns experienced by this renal population and the increase/fluctuation over time and toward death may be for several reasons: (1) their advanced and progressing disease, including progressive comorbidities, (2) limited recognition and management of symptoms and other concerns (despite dedicated services), or (3) limited effective interventions to address them. Although all three units had dedicated conservative management services, these were in the early stages of development at the time of the study. In addition, limited study of end-of-life symptoms and concerns in this population has markedly constrained our knowledge of effective interventions. Trajectories of functional status before and after dialysis have been studied, using change scores with logistic regression to determine the odds of functional decline 12 months after dialysis and, in a parallel analysis, a random-effects model to characterize functional trajectories before and after dialysis (50). Despite the challenges of nonrandom missing data (51), Tamura et al. (52) were able to show the continuing functional decline in nursing home residents despite dialysis and make an important contribution to informing dialysis decisions in this cohort. However, this approach can provide evidence on average patterns, but not capture the detail of individual trajectories. The importance of understanding these individual trajectories in the ESRD population is recognized (40), but the distinction between average and individual trajectories is rarely explicit. A number of authors have studied individual trajectories in populations with advanced illness, although most record data from two, three, or four time points, and few studies collect data over the whole of the last year of life. Kutner et al. (53) have studied the time course of symptoms in patients with various conditions, including kidney disease, after admission into hospice or palliative care programs. They showed no significant change in symptom scores over the 2 weeks after admission, although it is unclear how close to death this population was. This stability of symptoms reported by Kutner et al. (in contrast to the worsening or fluctuating seen in some of our participants) may reflect more active symptom management in the hospice population compared with this ESRD population. Patients with ESRD may also have more (or more advanced) comorbidities, particularly those following a conservative management pathway. European work showed that symptoms can be stabilized by palliative services in the last weeks of life (54), despite their tendency to worsen toward death (55). Several groups have successfully used formal statistical methods to map trajectories in conditions other than ESRD. Gill et al. (56) used semiparametric mixed modeling to determine trajectories of disability across conditions, but found disability could not be grouped according to disease. Others conducted formal statistical analysis of symptom data but reported only presence or absence of symptoms rather than overall symptom distress (57), summarized the complexity of longitudinal data by using change scores (58,59), or concentrated on quality of life (60,61). This study has several strengths. First, detailed individual follow-up minimized the amount of missing data. Only one trajectory could not be plotted because of missing data (Table 5). Second, a generic symptom assessment instrument, validated in both cancer and noncancer end-of-life populations (25,26) and adapted for renal patients (27), was used. This facilitates comparison with other populations. Third, and perhaps most usefully, this study used novel approaches to longitudinal data analysis to map and understand the trajectories of individual participants within the study population. This provides discrete trajectory groupings for individual trajectories, with more relevance to the clinical context, where individual patients are seen and assessed. One of the limitations of this study is the relatively small numbers studied. Numbers managed conservatively (without dialysis) in each renal center are small (3,4), and this limits the extent to which covariables can be studied; in particular, in this study, it was not possible to determine which variables might predict which trajectory group. In addition, those with major cognitive impairment were excluded from the study, and the (potentially higher) symptom burden of these less well patients is not reflected in the findings. This study is, however, the first to map illness trajectories in the conservatively managed stage 5 CKD population, and although the response rate that we achieved was moderate (73%), it is comparable to that achieved in similar studies of patients approaching the last months or years of life. In summary, this study is one of the few to follow patients over the last year of life and the first to do so in conservatively managed stage 5 CKD patients. It has shown a marked increase in symptom distress and health-related concerns in the last 2 months before death and considerable variation in individual trajectories. These findings are important, with considerable clinical implications. First, in planning optimal timing and delivery of care, care should address the moderate symptoms and concerns in last year of life but anticipate and meet the increased levels toward death. Flexibility and responsiveness of services is important, because the frequency/extent of interventions will vary according to the stage along the trajectory and the individual trajectory being followed. Second, understanding the tipping points (times of transition when care can be maximized to improve outcomes most effectively) can only be uncovered by longitudinal research. The increase in symptoms and concerns 2 months before death may be just such a tipping point or transition, where interventions to address symptoms and other concerns can be targeted to provide the most benefit. Third, increase in symptoms or other concerns may themselves give warning of approaching death; the predictive value of these changes may provide fruitful opportunities for further research. We thank the participants for considerable commitment and willingness to help this research and the funders, Guy's and St Thomas' Charity, without whose support this study could not have been undertaken. This work was completed at King's College London and was funded by Guy's and Street Thomas' Charity.
. (2009). Functional status of elderly adults before and after initiation of dialysis. New England Journal of Medicine, 361(16), 1539–1547.